It’s tough being a student in DC sometimes. Unlike LA or Berkeley or NY, DC seems to have a dearth of good, cheap food. It’s sorely lacking in great street food (although there are a number of food trucks nowadays, like Wonky Dog and the Fojol Brothers) and has barely any serviceable $10-$20 dinner options. It does, however, have some excellent high end restaurants like, oh I don’t know, Citronelle. So it’s nice to find a solid restaurant with well-executed food and great service. Firefly fits the bill perfectly. In a nutshell, it’s a wonderful place to have happy hour drinks with a few friends or take a date: it’s cozy without seeming small, social without being loud, and as comforting as a warm woolen blanket. It is a bit more expensive than it looks like it should be, but still worth the price. Mary Kate and I went to Firefly for dinner this past weekend and it did not disappoint. We started with a cocktail each: she had the grapefruit spritz and I had the tarragon fizz. The grapefruit spritz was a glorified greyhound and a bit too sweet for my taste. However, the tarragon fizz was right up my alley, with tarragon-infused vodka and St. Germaine, fresh lemon, and topped off by sparkling wine. It was garnished with some sliced tarragon and was pleasantly herbal; it was a nice aperitif. We then split two appetizers, the deviled eggs and the “2+2.” The deviled eggs were delicious and were garnished with crispy garlic chips, but the entire order was three egg halves. This is fine, I guess, but why only three halves? Where’s the last half? The 2+2 allows you to select two artisanal cheeses and two charcuterie items from off the menu. We picked the smokey blue and the red hawk cheeses, and the rabbit pate and chopped organic chicken liver. It was all served on a plank along with bread, cornichons, marmalade, berry jam, and whole grain mustard. The appetizers were nearly enough for dinner for two, but we weren’t done eating. She ordered the excellent mini pot roast and I had the Dungeness crab carbonara. I love the pot roast: the meat is marinated in red wine for hours and is fork-shreddingly tender. 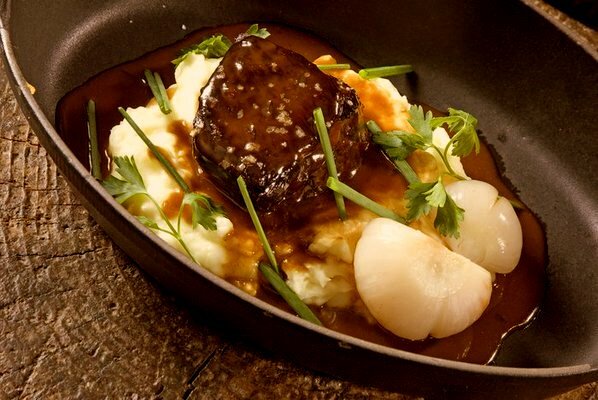 It comes in a cast-iron serving dish smothered in a rich au jus and perched atop a huge mound of mashed potatoes, accompanied by French carrots and onion. It is hands-down one of the most delicious dishes I’ve had at any restaurant, period. The Dungeness crab–perhaps the most noble of all crustaceans–lent its sweet, succulent meat to a carbonara made of squid ink tagliarini, bacon, and mushroom. There were two types of mushroom in the dish. There was savory shitake mushroom in the sauce, and there was a huge hedgehog mushroom on top of it all. The hedgehog mushroom is a dry, leathery variety that tastes of the woods, or like an oolong tea, and is shaped like a lettuce or a bush. All in all, this was a serious entree that I would recommend for umami lovers. 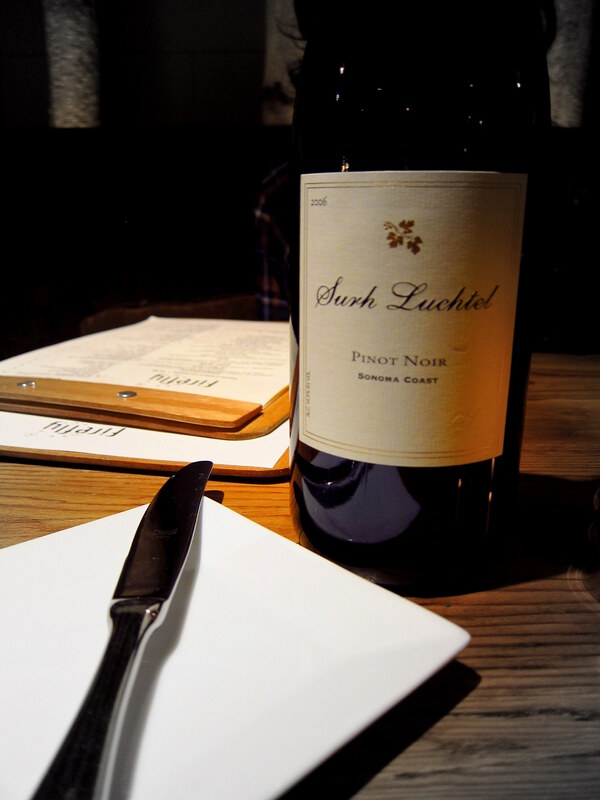 Throughout the meal we shared a bottle of the 2006 Surh Luchtel Sonoma Coast Pinot Noir. I had purchased a bottle of this online, through InVino. It was a nice example of California Pinot, not too concentrated, big, or fruity. It was still fruitier than I would have liked, but it also had some nice duskiness and maybe a trace of graphite. It had a short to medium finish and a medium body. All in all, good but not great. Nonetheless, it was a good food wine and enjoyable with both our dishes. 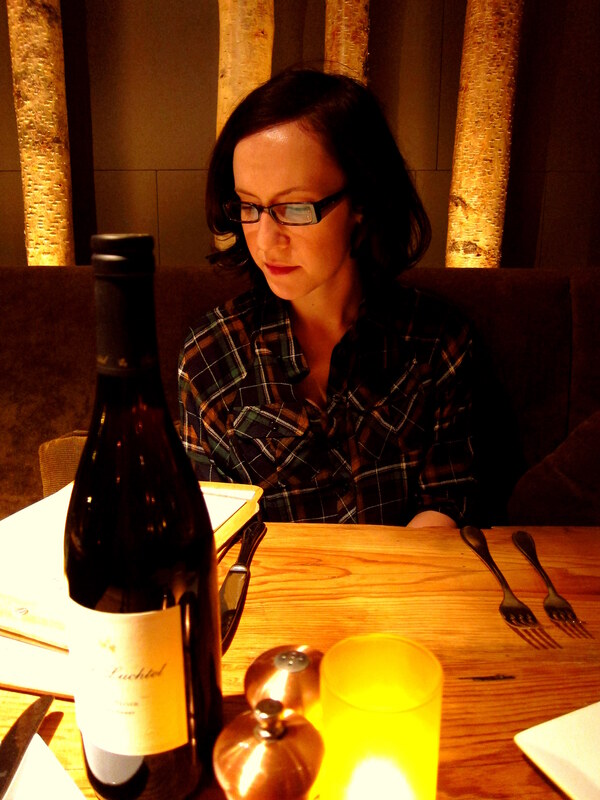 The $15 corkage fee wasn’t bad, either. The thing I love most about Firefly is the service. The cuisine is similar in style to Founding Farmers in Foggy Bottom, but I have never failed to be disappointed in the confused, slow service at Founding Farmers. Firefly, on the other hand, has an incredibly knowledgeable and helpful serving staff. Especially given that my SO and I can only infrequently afford DC dinner dates, quality of service is particularly important. Plus, the lavender lemon drop from their cocktail menu is pretty darn delicious. Yes! I’ve been to Firefly a few times for brunch, lunch, and dinner, and the service has been consistently good to exemplary. The service is on par to restaurants that are much more expensive. I agree with you on the comparison to Founding Farmers. I love that place and I’ve had excellent service there, but I’ve also had very confused to downright hostile service as well. So glad to hear an outstanding review of this restaurant! I just make reservations for my family to eat here before graduation. I haven’t tried it yet though so I was a little nervous…I am nervous no more! I love California reds. I guess it is acquired when you live so close to the wineries. Glad you enjoyed it!